I got in touch with Cidolfas, who organized the Final Fantasy Compendium from its origin in 2000 until 2009. I wanted to ask him a few questions about his website, his thoughts on the series, and FFIX in particular. It was a lot of fun, and it was great to hear his insight! – How was FFCompendium inspired? As far as I can remember, it was mainly just my obsession with cataloging things at the time. I particularly appreciated how the various Final Fantasies intertwined with each other – common enemies like the Bomb or Behemoth, for example, or even weapons with the same name – and had an urge to put it all in one place. All the other information just expanded from there while I was at it. I had a lot of spare time; I’d written a bunch of FAQs before that, as well as shrines for RPGClassics. – Which is your favorite Final Fantasy? Why? FF6 was the first one I ever finished and hence the game that got me started on the series, so it will always hold a special place in my heart; and FF7 was just so amazingly cool at the time. I also loved FF12’s localization. However, they all suffer from a variety of flaws. I have to say (and I swear it’s just a coincidence) that I feel FF9 is the most solid game in the series. 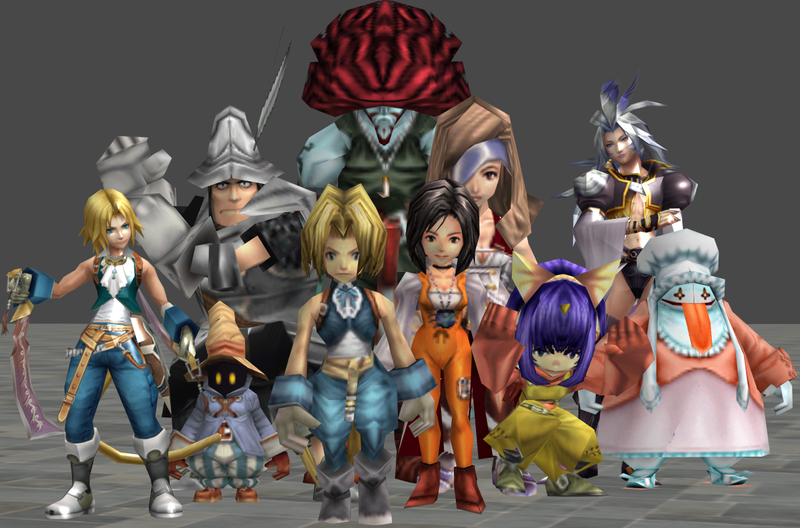 – Who is your favorite character/What is your favorite part of/about FFIX? Why? I’m not going to say that any individual character is my favorite, but I do really enjoy the interactions between characters. FF9 is excellent (with the exception of Freya) at giving characters a fully rounded personality, and illustrating that by having plenty of dialogue between them; it’s not just “let’s get to the next goal”. Zidane is generally the catalyst, of course, and is a very fun character; Steiner’s feelings about him grow throughout the game in a way that arguably is more satisfying than Zidane’s love for Garnet. I also enjoyed Eiko’s self-imposed love triangle with herself, Zidane and Garnet. Even Amarant’s continual confusion about Zidane is entertaining. I thought Kuja was a dumb protagonist to start with, but the last ten hours of the game turn him into an extremely tragic figure. In general I just liked the variety of the gameplay, the surprising maturity of the plot, the perfect challenge level (not too frustrating, not a cakewalk), and all the various nods and references to other Final Fantasy games. – I’ve found that there is still a thriving community of fans for even the older Final Fantasies. Has this been your experience? Why do you think that might be? I’m sure they’re out there, but to tell the truth I haven’t really been part of a video game “community” in quite some time. I resolutely stick to single-player games, none of my “real life” friends play RPGs, and the one site whose forum I do read regularly (RPGamer) is more centered around news than discussing old treasures. I personally don’t enjoy, in the immortal words of Joss Whedon, “opening up to see the tick-tick-tick of a heart” of any work – who’s your favorite character, what if this guy went up against that guy in a fight, alternate interpretations of the story – so that kind of thing doesn’t appeal to me. I feel that while some Final Fantasy games have stood the test of time (FF5, 6 and 9 in particular), some of the older ones (FF1-2) are almost unplayable in their original form, while for others, particularly FF7-9, the jagged graphics may turn others off. Still, there’s plenty of goodness and fun in many of them. I particularly enjoy the sprite graphics of FF5 and 6 – “retro” gaming is very in, now, on iPhones, Android, Flash games, indie games, etc. – and there’s a simplicity to it that new fancy games don’t have. The video game industry – particularly the RPG industry – seems to be stuck on learning all the wrong lessons, so it’s definitely nice to go back to a simpler time with more solid offerings than the flashy, ADD-causing products of today. – How was interviewing Richard Mark Honeywood? How did you get in contact with him? Do you have any other contacts from that era at Square? The interview was a lot of fun. My memory’s a bit fuzzy, but I think I got in contact with him via a freak coincidence – someone who read the site actually happened to know him. We had to go through a Squeenix publicist, but she was really laid-back and didn’t bug me about any of my questions. Richard was very frank about things and gave me a ton of information – he even roped in some of his other localization co-workers to offer their insights. Doing interviews by e-mail is a very freeing format, since there’s no time pressure. Unfortunately that was the only contact I ever had with Square Enix, and of course Richard no longer works there. – FFCompendium has stopped being updated as of June 2009, and your other blog, “The Role-Playing Jew”, is on indefinite hiatus at the moment. Do you have any other projects in the works? I’m afraid not. It’s one thing to start a website at 19, or a blog at 27 when you’re still single, but another thing entirely to do so when you’re 33 and have a wife and baby daughter. 😎 I was contemplating doing something similar to my blog but in much smaller format (say a paragraph or two) but I couldn’t find a good platform for it. There are always ideas percolating in my head (I’ve always wanted to try to write a book of some kind), but it’s the lack of time and energy that does it for me. Thanks so much to Cidolfas to answering my questions! Let me know if you have questions for him, and I’ll see what I can do! My Let’s Play may not be working at the moment (which I will work on in about an hour, when I get outta work), but I have found something really, really cool on the internet today. Anyway, I was snooping around, and I found this article on his Mistwalker blog. This post was apparently a .txt file that was on a backup hard drive of his, and it details the very beginning of FFIX. I had never seen it before, and I thought I’d share it, cuz it seemed super cool! I was running around, doing some random searching for cool FFIX-related stuff, and I came across these super-cool pictures. Except they’re not just pictures. THEY’RE MODELS. Don’t be fooled by their lack of bikinis or bleeding-edge fashion – those aren’t the type of models I’m talking about (although I’m sure that Beatrix could have a great career in such a profession, if she weren’t so busy being the best swordswoman in Gaia… On a side note, bravo, Steiner. What a catch). These are models from the video game, meaning it’s a polygonal frame with textures wrapped around to make it look like the character. I’m quite a beginner at this type of thing, so I’m not going to embarrass myself by trying to explain all the intricacies of what this means, but I will tell you that I’ve been tooling around with programs like Blender, XNLara, and GIMP to try and make higher-resolution, sexier versions of these models. If Squeenix doesn’t wanna make a FFIX remake, damn it, I’m going to make some awesome-looking models, at least! … Speaking of which, do any of you have experience with game modeling/texture-mapping? Cuz I need all the help I can get.